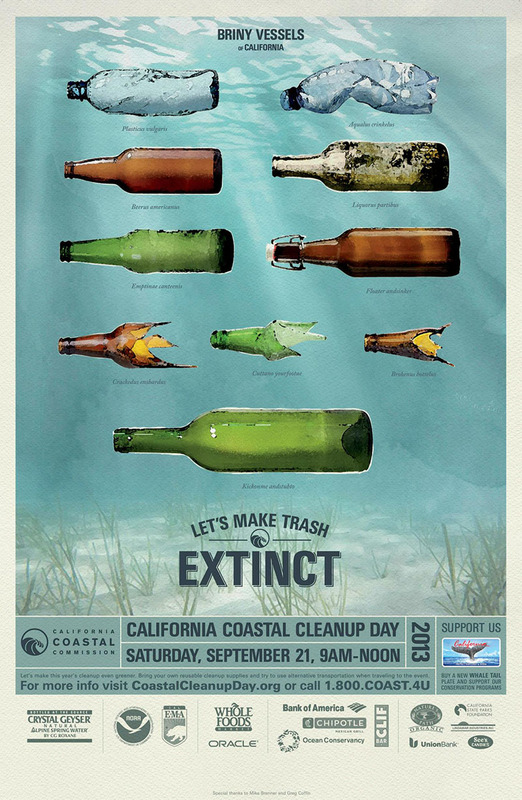 If It's Hip, It's Here (Archives): Beautiful Creative Encourages You To Beautify Our Beaches For California's Coastal Cleanup Day. 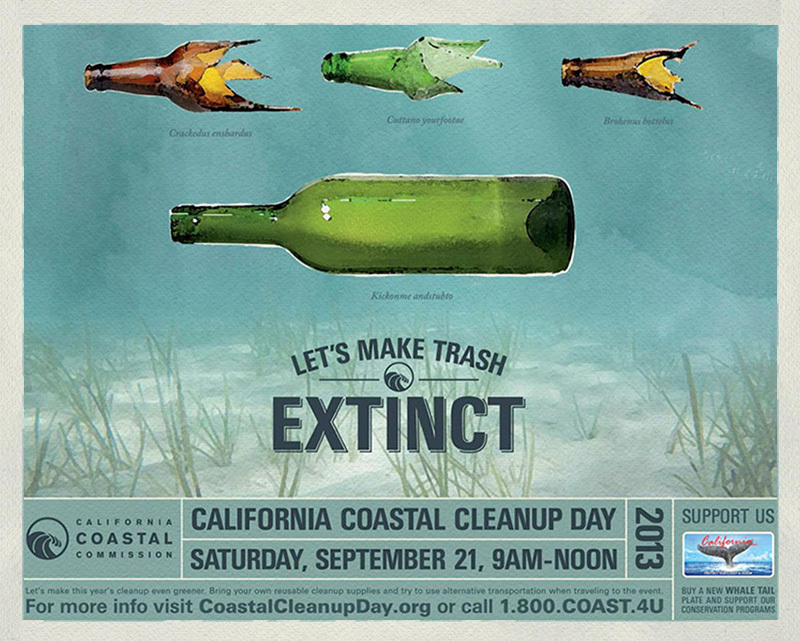 Beautiful Creative Encourages You To Beautify Our Beaches For California's Coastal Cleanup Day. 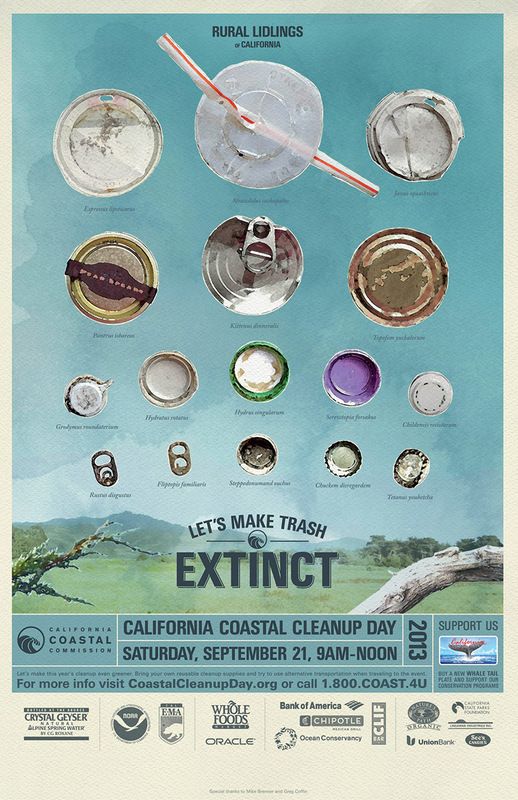 Every year, on the third Saturday in September, people join together at sites all over California to take part in the State's largest volunteer event, California Coastal Cleanup Day. In 2012, over 65,000 volunteers removed almost 770,000 pounds of trash and recyclables from California's beaches, lakes, and waterways. Families, friends, coworkers, scout troops, school groups, service clubs, and individuals come together to celebrate and share their appreciation of California's fabulous coast and waterways. 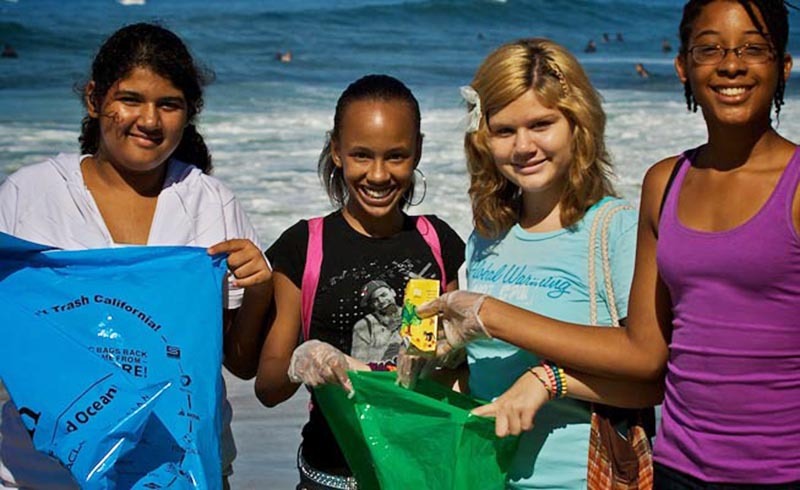 The event is part of the International Coastal Cleanup, organized by the Ocean Conservancy, which is the largest volunteer event on the planet. To promote this annual event, posters and digital work are created yearly, much of it wonderful. This year's campaign is no exception. 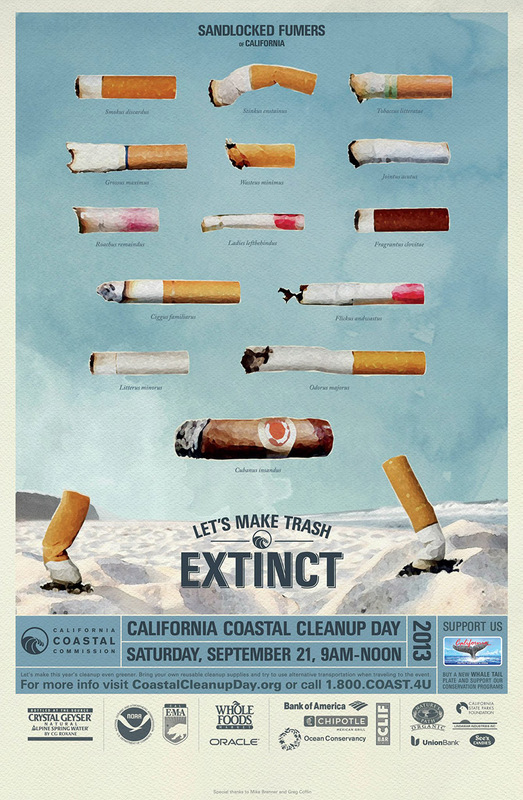 Created by Art Director Greg Coffin and Copywriter Mike Brenner under Creative Director Ron Lim, the posters and other promotional pieces have turned trash into a 'species' whose extinction we need to bring about. In addition to the above posters, they've created a daily digital social media campaign that is a 29 day countdown to the event. Each day an individual piece of trash encouraging you to be part of the solution appears along with the number of days left until the event on the California Coast's official Facebook page. One example is shown below and several more are scattered throughout this post. Vast amounts of plastic debris litter the world's oceans causing all manner of harm, and most of this debris comes from land. Our beaches are collecting spots for trash from city streets and highways. Trash travels - via inland waterways, storm drains, sewers, and on the wind, and eventually ends up on the coast. If not removed, this debris will end up in the ocean. Beach cleanups are a last line of defense - to prevent debris from causing harm to our oceans, to wildlife, to our coastal economies, and even to beach-goers. Californian’s love their coast and ocean — nine out of ten will visit the beach at least once this year. When they arrive at the beach, they are finding a lot more than sand and surf. During a recent summer, Orange County collected enough garbage from six miles of beach to fill ten garbage trucks full of trash every week, at a cost to taxpayers of $350,000. Other California counties spend even more. Entanglement: Common items like fishing line, strapping bands and six-pack rings can hamper the mobility of marine animals. Once entangled, animals have trouble eating, breathing or swimming, all of which can have fatal results. Plastics take hundreds of years to breakdown and may continue to trap and kill animals year after year. Ingestion: Birds, fish and mammals often mistake plastic for food. Some birds even feed it to their young. With plastic filling their stomachs, animals have a false feeling of being full, and may die of starvation. Sea turtles mistake plastic bags for jellyfish, one of their favorite foods. Even gray whales have been found dead with plastic bags and sheeting in their stomachs. Cleanups take place along bays, creeks, rivers, highways, and the coast at more than 800 locations throughout California. Use the map or list of California counties on this page to find your cleanup site and then contact the local coordinator. If there is no cleanup scheduled in your area, you can volunteer to set one up, just call (800) COAST-4U or e-mail coast4u@coastal.ca.gov. 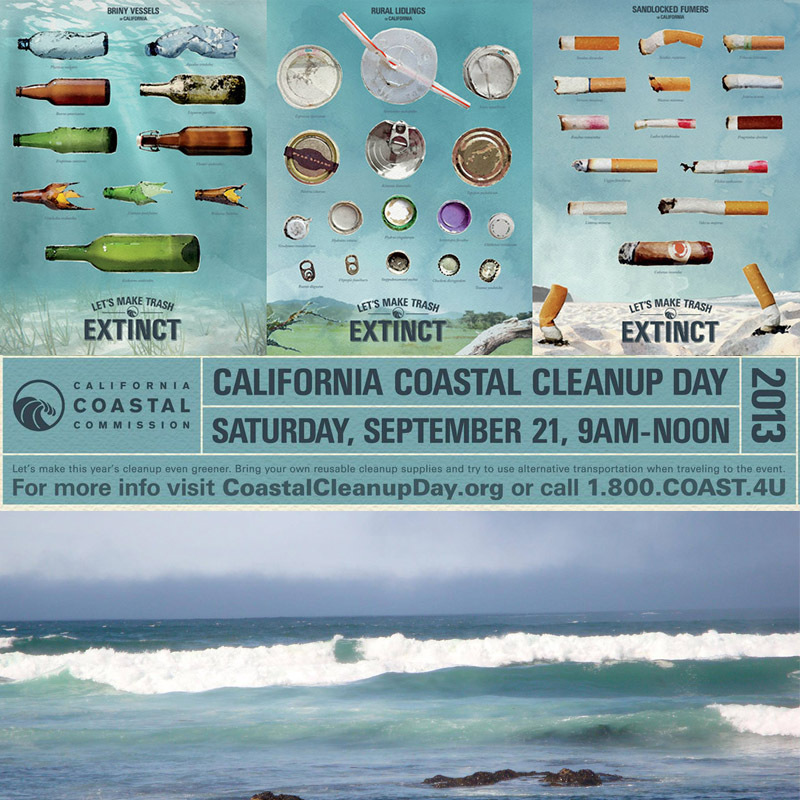 Register here to join the California Coastal Clean Up.